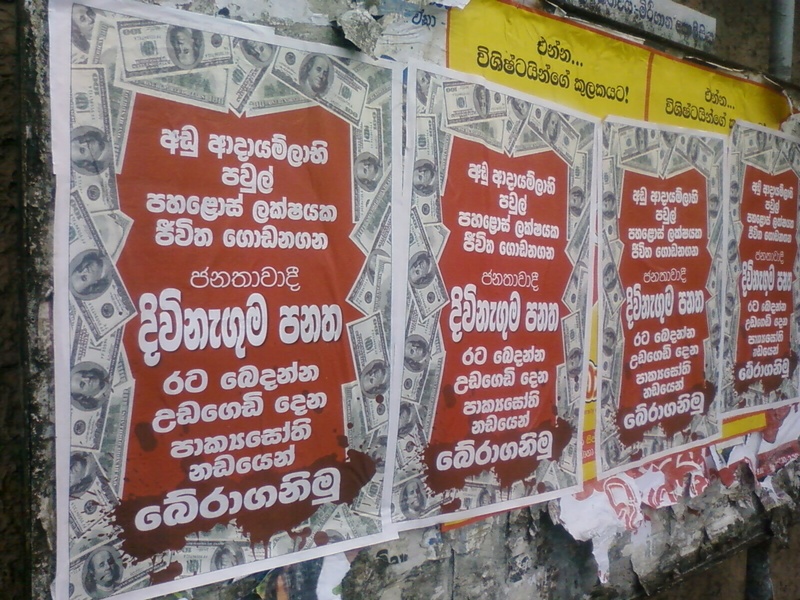 16 October 2012, Colombo, Sri Lanka: The Centre for Policy Alternatives (CPA) views with very serious concern the appearance of posters in Sinhala on Monday, 15th October 2012 in the environs of Colombo, the English translation of the text of which states: “Let us save the pro-people Divineguma Act that builds the lives of fifteen lakhs of low income families from the Paikiasothy gang that aids and abets the separation of the country.” Photographs of the poster are attached. The chilling import of the reference to CPA Executive Director, Dr. Paikiasothy Saravanamuttu, requires no emphasis in the current political climate of violence against critics of the government and the culture of impunity for perpetrators. This is the most recent attack against CPA and its Executive Director. It must be unreservedly condemned. The context of the reference in the poster to the Divineguma Bill, which is currently in the enactment process, and CPA’s legal challenge to its constitutionality, is as follows. When the Bill was placed on the Order Paper of Parliament on 10 August 2012, both CPA and Dr. Saravanamuttu in his capacity as Executive Director, filed petitions challenging the Bill in the Supreme Court, bringing to the Court’s attention a number of substantive and procedural grounds on which the Bill was potentially inconsistent with the Constitution. There are several substantive areas of constitutional concern in what is envisaged in the Bill, including the doctrine of the separation of powers, the possible reversal of certain subjects devolved to Provincial Councils, Parliament’s control over public finance and its general oversight over the executive, and public access to information held by government. We will make no further comment at this stage on these issues as the matter is pending before the Supreme Court. On the procedural issues, however, the Supreme Court agreed with the averment in our initial petitions that the substance of the Bill impacts on a number of devolved subjects in such a way as to require it to be passed in terms of the special procedure laid down in the Constitution, which involves the consent of the Provincial Councils. Pursuant to this determination by the Supreme Court, the government sent the Bill to the Provincial Councils where consent has been forthcoming, except in the case of the Northern Province, where there is no elected Provincial Council. There is currently a legal challenge by a Member of Parliament for the Jaffna District to the consent provided on behalf of that Province by the Governor. Regardless of the matter being referred to the Supreme Court on the question of the role of the Governor, the Bill was tabled for the second time in Parliament on 9 September 2012. CPA and Dr. Saravanamuttu have challenged the Bill yet again, with the matter to be taken up in the Supreme Court this week. 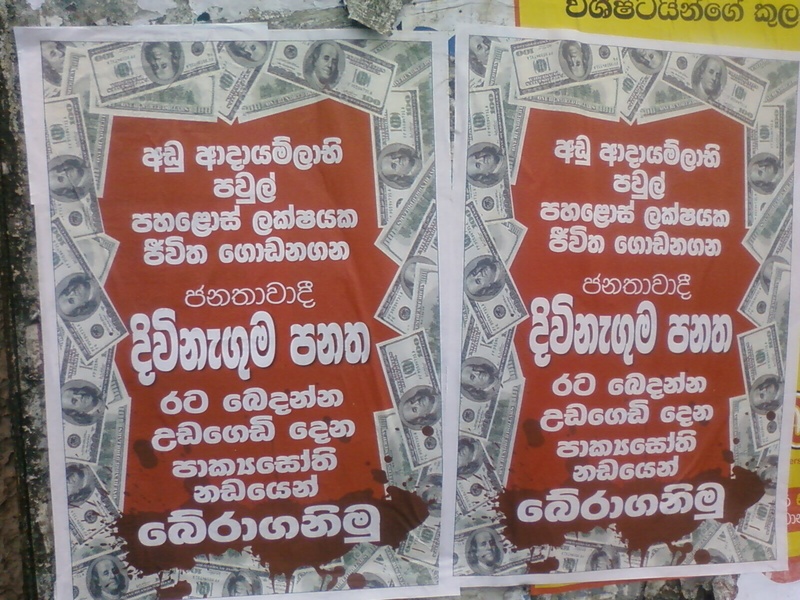 Aside from these attacks, CPA also wishes to disclose that the military visited CPA on the morning of Monday 15th October, the same day the posters appeared. The military personnel informed CPA security that they in turn had been told by the Postal Department that the CPA address was one that had a connection to the Elections Department, which they were checking. Whether there is some causality between the appearance of the poster and the visit by the military, or whether it is mere coincidence, we are at a loss to understand how the military has a role in the conduct of such inquiries in terms of the law of the land. Beyond the vilification and incitement of public hatred against an individual, we are concerned that these developments signify deeper changes that seem to be occurring in our post-war political culture. The government seems increasingly to regard not only critique and dissent from civil society, but also any constitutional restraints on its power as unacceptable to its agenda, and its stock response to any form of democratic dissent is to accuse opponents of a lack of patriotism. It seems to regard populism and majoritarianism as the only legitimate elements and forms of democracy, and needless to reiterate, CPA is founded on a set of beliefs, which are directly contrary to such perspectives on democracy. We believe that forms of electoral democracy that are unrestrained by constitutional controls, checks and balances, the rule of law and the independence of the judiciary, fundamental rights and minority protections, devolution, and a vibrant and sceptical electorate, media and civil society, constitute no democracy at all. The emasculation of these fundamental principles in the purported interests of economic development is not only a false dichotomy, but also serves to corrode the traditions of choice and change we have enjoyed as part of the democratic way of life since 1931. As the history of many countries which have had the unfortunate experience of populist authoritarianism has shown, the attenuation of legal and political restraints on political power that is exercised, at first instance, in the form of purportedly ‘pro-people’ policies have an alarming tendency to turn anti-people before long, when governments get used to centralisation and an absence of controls. In the light of recent manipulations of the Constitution, the strengthening of the executive at the expense of both Parliament and democracy, the undermining of established arrangements for ensuring good governance, the treatment of political opponents, violence against protestors, activists and journalists, enforced disappearances, attacks on the independence of the judiciary, the militarisation of civic life, and the pervasive culture of impunity, we wish to state categorically that we see a process taking place in Sri Lanka today which is aimed at dismantling surviving liberal democratic institutions and norms, including through the demonisation of critical voices. These developments are taken lightly at the peril of our democratic future. Download images of the poster here and here. Download PDF of this Press Release in English here, Tamil here and in Sinhala here.